We can proudly can state that PPU has successfully finished the efficiency & certification for a containerised high flow DAF cell. Based on our patented technology of airlift discharge, we have developed in the last 18 months a square DAF cell with a capacity up to 60m3/h flowrate. With this DAF we can now meet the requirements of our partners in the food industry sector, by using the same robust technology – but on a larger scale. The flotation cell covers the range from 50 up to 100 m3/hour flow, and it is an extension to the famous Clearfox airlift DAF series, which has a limit when the flowrate is higher than 50 m3/hour. Watch our news area, as the case study will be presented soon! The ClearFox® dissolved air flotation series is characterized by its extremely robust, space-saving design. It can be supplied skid mounted or fully containerized. The great success of this technology is based on its simple and cost effective operation. The systems have been installed in many major European food producing facilities and industrial wastewater applications globally. The ClearFox® DAF modules can be supplied with other ClearFox® modules as part of a larger solution or as standalone solutions. The ClearFox flotation plant is fully automatic. A specific, clog-free helical rotor pump leads the water from the collection container (collection tank or skimming tank provided by the customer) to the reactor. The wastewater flows through a pH-regulation section where pH-fluctuations are compensated. 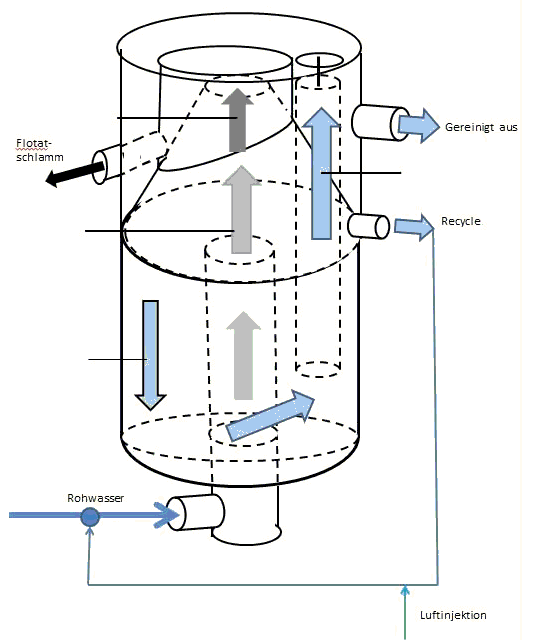 Then, wastewater flows continuously into the reactor. Additives are developed in a polymer preparation station in order to aid the flocculation and flotation process. These are mixed fully automatically into the inflowing waste water with flocculators. A multiphase pump saturates the outlet of the water continuously with air, which is then recirulated into the reactor. The pressure release causes a flotation of the floatable particles. These accumulate in the upper section of the reactor and are separated by a self cleaning process, or with a scraper for special applications. Flotation sludge is removed via a cone-shaped opening with compressed air. The plant is fully automated and depending on the waste water flow, a high quality effluent quality is achieved at all times. The system is very robust, and uses no clearing devices with movable chains or scrapers (needing lubricants etc. ), that require constant maintenance. The Systems have proven their reliability in many industries over the years, particularly in the food industry. The Cleaning-efficiency depends on how high the degradation rate of the waste water is and operator behavior. The effluent is largely free from fats and purified to an indirect discharge quality, pH 6.5-7, COD 1.500 mg / l, BOD 1.000 mg / l, TSS 500 mg / l. There is no change in temperature as a result of the process, and the effluent quality is suitable for biological post-cleaning. If not installed in a container, the scope of supply consists of three parts that can be set up freely and are mounted on skids. These parts (pump station, flotation station, dosing station), as well as the control cabinet, can be easily transported with forklifts. The base area for the system components must be firm and level (foundations), the environment dry, covered, dew protected; in closed structures with multiple air changes according to the regional regulations. In order to regulate the pH in the water, acids or alkalics are added into the system. The system also has a metering system for fission products (flocculant) and polymer (flocculant-help). The specific consumption is determined in the laboratory and this is optimized by us after the start up of system. In the ClearFox® dissolved air flotation system, fats and oils along with other dissolved substances which are extracted, are removed from the wastewater as flotation sludge. The resulting amount is dependent on the concentration of such substances in the wastewater. It can be assumed that about 40 to 60 liters of flotation sludge per m³ of wastewater are produced at average concentrations. This is approximately 4 to 6 % of the volume of the waste water entering the DAF system. The flotation sludge further dehydrates during storage, thus the longer it is stored, the less water content the sludge has. It is recommended to use enclosed structures /systems to avoid odour problems.